When Halloween came around this year spacekid, age 5, was thrilled. She wanted the house to be scary, wanted to visit halloween stores, and of course wanted to watch scary movies but according to her, none of the movies were scary ENOUGH. She used to love Coraline and Nightmare Before Christmas but was like, "no really I want a REALLY scary movie!" Moster High? Hotel Translyvania? Addams Family? So finally I just tried to think of movies that scared me. Needed something that pretty quickly got into monsters. Put on Silent Hill, which is basically a straight horror with spasmodic bandaged zombie nurses slicing at each other while a half-naked metal triangle head cuts people in half. But with a heartwarming anti-bullying message, amiright? This might have worked out though. I noticed since we let her watch Silent Hill about seven times, she seems to be at her threshold and has stopped asking for scarier films. She tells me it's her new favorite and wants to watch it all the time, but doesn't want to keep going. And I've noticed she's also enjoying movies like Addams Family - it's like she can relax and enjoy more kid-friendly stuff since she knows we're not using them to lie to her about what's out there. I have told her, and she checks to make sure, that this stuff is fake. She knows zombies aren't real. We talked about how the blood is really ketchup or syrup or chemical sludge and how people make up effects in movies just like she draws pictures and makes art. Also want to note that my brave, zombie-loving kid is still afraid of people in sport mascot costumes. So if by chance I'm ruining her developing brain and raising a serial killer, I want you all to know her weakness. Well, yeah, the mascot is REAL. The pyramid head is only on the TV! Ah, a child after my own heart. I was addicted to horror stuff as a child, but those giant costume characters at Disneyland terrified me. Pan's Labyrinth? Coraline? Hell, James and the Giant Peach? hey I said coraline! we have james and the giant peach too, yup, agree, love it. I'm 35 years old, and I can't even watch 10 minutes of Silent Hill, seriously *cry* That is so scary!! LULZ at her random fear. 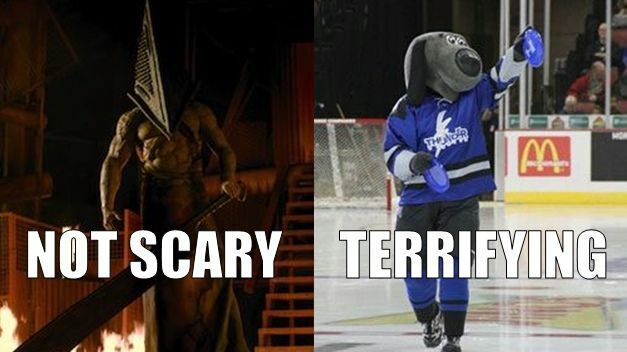 My kids are terrified of masked sports mascots too.